Q. How do I know when it is time to refinish my deck? A. As soon as the stain is fading out or begins to peel. Q. What should I stain my deck with? A. Stick with what was last applied. Roughing up the surface somewhat by sanding prior to staining will help the stain adhere better. Q. How long does redwood last? A. If it is properly maintained it will usually last about 20 years. Q. What is the difference between semi-transparent, transparent, and solid stains? A. Transparent stains let all of the wood grain and natural wood beauty show but only lasts one season. Semi-transparent lasts 2-3 years and allows some of the grain to show depending on the brand and color of the stain. Solid is similar to paint but much tougher and lasts 4-6 years. Q. Can I repair my deck? A. Absolutely. This is the easiest and most economical way to get a few more years out of an older deck. A. The color and look of these materials depend on the brand and form. Some weather and some retain their color. Most are 16" on center but some are 24" on center. Some show the screws and some don't. One tip is to investigate what railing system will look good with your new deck. There are different railing systems available at different costs and different materials. A. I provide free written estimates with no obligation. You are always free to choose the materials for your deck, but keep in mind that some materials cost more than others. Deposits are required for larger jobs. I know that you will be satisfied with my work because your satisfaction is my #1 priority. Q. How often do I need to service my deck? A. Most weatherproofing should last at least two years. However, if your deck gets excessive sun (dryness) or no sun at all (mildew), you may need to service it more often. If you use a good weatherproofer and your deck gets a good balance of sun and shade, it could last up to five years. Q. How long should I wait until I weatherproof a new deck? A. Through our experiences we find that all woods are different. Some decks are ready to be treated immediately, and some must wait up to 2-3 months. Most damage to a deck happens quickly, so evaluate your deck in a timely fashion so that irreparable damage is not done. Q.What type of finish I use on my deck? A. This is an easy one. Unless you are in love with the darker color, go with the transparent stain that has just a little pigment. If you go with a dark semi-transparent or solid stain, it is very difficult to go back to a transparent product that shows the grain of the wood better. A. Remember that the lighter the finish the lesser the protection. Transparent finishes that are truly clear last only 10-16 months. 100% Transparent finishes with pigment such as Cabots Clear Solution suggest reservice every 24 months. Semi-transparent or Semi-Solid Stains typically last 3-4 years. Solid Stains last from 3-5 years typically. The darker the color with all products, the longer it takes the sun to fade it. The lighter colors do fade more quickly. The transparent finishes show 100% of the grain. Semi-transparent and Semi-solid products show 35-75% of the grain. Solids cover all grain and can be custom matched. Why doesn't my deck bead up? How long must my deck dry before use? A. Every deck should be washed before weatherproofing. All lumber especially pressure treated pine contains a chemical commonly known as mill glaze. It protects the wood during the storing in lumberyards. This must be removed prior to weatherproofing to ensure proper adhesion. Q. Can you remove grill grease or citronella candle oils from my deck? A. We can remove some of them, but unfortunately the oils penetrate the wood and set in. We will do our best, but never promise full removal without sanding. A. A lot of composite decks will NEVER need a protective finish. However, the outside elements such as pollen, moisture and lack of sun exposure can promote mold and growth on the deck. We typically rinse down composite decks every 1-2 years. Q. My deck is getting old and I am tired of maintence, but don't want to rebuild, what can I do? A. We have a program called re-decking that promotes the use of existing framing of current deck while removing the existing rails and flooring. We often convert old splintery decks to maintenance free decks at a discount because we do not need to create a new frame. What other deck tips do you have? Clear ice, snow, and leaves off your deck as often as possible. 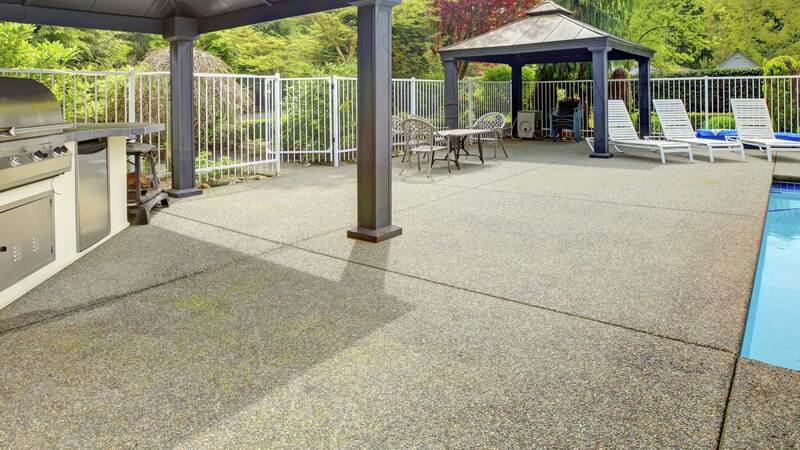 Protect around the barbecue to keep grease off of your deck. Give your deck some shade with an awning or tree. Occasionally rinse your deck so dirt doesn't get ground into the wood. If you have toys, pots, or other objects on the deck, don't let them sit in one spot. Move them around every so often so the deck is getting weathered at an even rate. Don't wait too long before treating deck. Decks can be ruined quickly if they are ignored!